1. Information on how to enter and prizes form part of these Terms and Conditions. Participation in this promotion is deemed acceptance of these Terms and Conditions and any entry not complying with these Terms and Conditions is invalid. 2. Entry is open to Australian residents over the age of 16. Any entrant under the age of 18 years must have their parent or guardian’s permission to enter the promotion. Employees of the Promoter and their immediate families are ineligible to enter. 3. Promotion commences at 9am Australian Eastern Daylight Time (“AEDT”) on Monday 3 December 2018 and closes at 9am AEDT on Monday 10 December 2018 (“Promotion Period”). 1. Comment at least one emoji on the competition post on the Promoter’sFacebook (lm.city/2KXJn5n), Instagram (lm.city/2Ph0xeo) or Twitter(lm.city/2PjlNQI) and use. 5. Participants may enter multiple times however each entry must be unique. 6. This is a game of chance and skill plays no part in determining the winners. 8. Total prize pool for the promotion is valued at $496 RRP. 9. Spending money, meals, taxes, insurance, transport to and from departure point, transfers, items of a personal nature and all other ancillary costs, unless otherwise specified in the prize description herein, are not included. 11. A random electronic draw will be conducted to determine the winners at 126-138 Main Road Speers Point NSW 2284 on Monday 10 December 2018 at 1pm AEDT. 12. 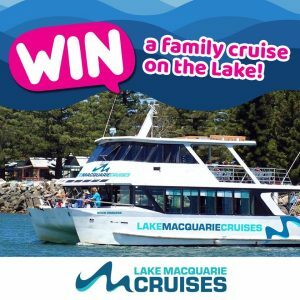 The first entry drawn will receive one (1) family pass for a Nova Cruise Lunch on the Lake experience. The second entry drawn will receive one (1) family pass for a Nova Cruise Lunch on the Lake experience. The third entry drawn will receive one (1) family passes for a Nova Cruise Boom Net and Biscuits experience. The fourth entry drawn will receive one (1) family passes for a Nova Cruise Boom Net and Biscuits experience. 13. The winners will be notified via direct message on the social media platform on which they entered, by 5pm AEDT on Friday 14 December 2018. 14. The Promoter reserves the right to verify the validity of all entries and reserves the right to disqualify any individual entrant or group of entrants for tampering with the entry process. The Promoter may in its complete discretion preclude that entrant from participation in any or all future promotions of the Promoter. 15. Prize is not transferable, non-redeemable for cash and subject to availability at time of booking. 16. Prize value is correct at time of printing but no responsibility is accepted for any variation in the value of any prize. 18. The Promoter retains the absolute discretion to require a winner to provide proof of age, residential address and identity in a form determined by the Promoter before awarding the prize. If the winner is under the age of 18, the prize will be awarded to their parent/guardian. 19. If the prize remains unclaimed within one month of the judging date, the Promoter may conduct an unclaimed prize draw at 126-138 Main Rd Speers Point NSW 2284 at the same time and place as the original draw. The first valid entry drawn will win the unclaimed prize, and so on until all unclaimed prizes have been awarded. The winner will be notified via direct message on the social media platform on which they entered, within two (2) business days of the draw. 20. The Promoter is not liable for any loss or damage whatsoever which is suffered, including but not limited to indirect or consequential loss, or for personal injury suffered or sustained during the course of accepting or using the prize, except for any liability which cannot be excluded by law. 22. Entrants and prize winners consent to their name and suburb being published by the Promoter or the media. Entrants and prize winners must also consent to a short interview with Council and the media where their interview responses may be used in media or promotional material. 23. Prize winners should look to the manufacturer of products or provider of services awarded for all warranties. Winners should look to the Retail Supplier for locations of service providers. These terms and conditions do not exclude or limit the application of any story provision (including a provision of the Competition and Consumer Act 2010) where to do so would contravene that statute or cause any part of these terms and conditions to be void. 24. The Promoter is not responsible if a prize is lost, stolen, destroyed, or used without your permission. The Promoter is also not responsible for the availability and provision of services associated with the use of the prize. 25. If any prize (or part of any prize) is unavailable, the Promoter, in its discretion, reserves the right to substitute the prize (or that part of the prize) with a prize to the equal value and/or specification, subject to any directions from a regulatory authority. 26. If for any reason this promotion is not capable of running as planned, whether caused by infection by computer virus, mobile phone failure, line drop out, bugs, tampering, unauthorised intervention, fraud, technical failures or any other cause beyond the control of the Promoter which corrupt or affect the administration, security, fairness or integrity of the Promotion, the Promoter reserves the right in its sole discretion, to cancel, terminate, modify or suspend the Promotion. The Promoter may in its sole discretion disqualify any individual who tampers with the entry process. 27. The Promoter is Lake Macquarie City Council. [ABN 81 065 027 868] of 126-138 Main Road Speers Point NSW 2284.